The Sarus Crane (Grus antigone) is a large non-migratory crane found in parts of the Indian Subcontinent, Southeast Asia and Australia. The tallest of the flying birds, standing at a height of up to 1.8 m (5.9 ft), they are conspicuous and iconic species of open wetlands. The Sarus Crane is easily distinguished from other cranes in the region by the overall grey color and the contrasting red head and upper neck. They forage on marshes and shallow wetlands for roots, tubers, insects, crustaceans and small vertebrate prey. Like other cranes, they form long-lasting pair-bonds and maintain territories within which they perform territorial and courtship displays that include loud trumpeting, leaps and dance-like movements. In India they are considered symbols of marital fidelity, believed to mate for life and pine the loss of their mates even to the point of starving to death. The main breeding season is during the rainy season, when the pair builds an enormous nest "island", a circular platform of reeds and grasses nearly two metres in diameter and high enough to stay above the shallow water surrounding it. Sarus Crane numbers have declined greatly in the last century and it has been estimated that the current population is a tenth or less (perhaps 2.5%) of the numbers that existed in the 1850s. The stronghold of the species is India, where it is traditionally revered and lives in agricultural lands in close proximity to humans. Elsewhere, the species has been extirpated in many parts of its former range. The adult Sarus Crane is very large with grey wings and body; a bare red head and part of the upper neck; a greyish crown; and a long greenish-grey pointed bill. In flight, the long neck is held straight, unlike that of an heron, which folds it back, and the black wing tips can be seen; the crane's long pink legs trail behind them. This bird has a grey ear covert patch, an orange-red iris and a greenish-grey bill. Juveniles have a yellowish base to the bill and the brown-grey head is fully feathered. The bare red skin of the adult's head and neck is brighter during the breeding season. This skin is rough and covered by papillae, and a narrow area around and behind the head is covered by black bristly feathers. The sexes do not differ in plumage although males are on average larger than females; male Sarus of the Indian population can attain a maximum height of about 180 cm (5.9 ft) making them the world's tallest extant flying bird. The weight of nominate race individuals is 6.8–7.8 kg (16 lb), while five adult sharpii averaged 8.4 kg (18.5 lb). Across the distribution range, the weight can vary from 5 to 12 kg (11–26 lbs), height typically from 115 to 167 cm (45–69 in) and the wingspan from 220 to 250 cm (87–100 in). Birds from Australia tend to be smaller than birds from the north. In Australia, the Sarus can easily be mistaken for the more widespread Brolga. The Brolga has the red coloring confined to the head and not extending into the neck. The species has historically been widely distributed on the lowlands of India along the Gangetic plains, extending south to the Godavari River, west to coastal Gujarat, the Tharparkar District of Pakistan, and east to West Bengal and Assam. The species no longer breeds in the Punjab, though it occurs sporadically on the Indian side in winter. Sarus Cranes are rare and occur in very low numbers in West Bengal and Assam, and are no longer found in the state of Bihar. In Nepal, its distribution is restricted to the western lowland plains, with most of the population occurring in Rupandehi, Kapilvastu, and Nawalparasi districts. There are two distinct populations of Sarus Cranes in South-east Asia: the northern population in China and Burma, and the southern population in Cambodia and Vietnam. The Sarus used to extend to Thailand and further east into the Philippines, but became extinct. In 2011, captive bred cranes were reintroduced into Thailand. In Australia they are found only in the northern parts, and are partly migratory in some areas. The global range has shrunk and the largest occupied area is now in India. With marshlands largely destroyed, these cranes are increasingly dependent on wet paddy fields in India. Although now found mainly at a low elevation on the plains, there are some historical records from highland marshes further north in Harkit Sar and Kahag in Kashmir. The Sarus Crane breeds in some high elevation regions such as near the Pong Dam in Himachal Pradesh, where populations may be growing in response to increasing rice cultivation along the reservoir. Sarus Cranes preferentially use wetlands or uncultivated patches amid flooded rice paddies (locally called khet-taavadi) for nesting in India. Breeding pairs are territorial and prefer to forage in natural wetlands, though wet crops like rice and wheat are also frequented. This species was described by Linnaeus in 1758 and placed in the genus Ardea that included the larger herons. Edward Blyth published a monograph on the cranes in 1881 in which he considered the "Sarus Crane" of India to be made up of two species, Grus collaris and Grus antigone. Most modern authors recognise one species with three distinct populations that have been treated as subspecies, although the status of one extinct population from the Philippines is uncertain. The nominate subspecies from India is the largest, and in the east from Myanmar is replaced by race sharpii that extends into the Southeast Asian islands. The nominate form from the Indian subcontinent is well marked and differentiated by having a white collar below the bare head and upper neck, and white tertiary remiges. Some authors consider antigone and sharpii as representatives of a formerly continuous population that varied clinally. The race in Australia, initially placed in sharpii (sometimes spelt sharpei but amended to conform to the rules of Latin grammar) has been separated and named as the race gilliae (sometimes spelt gillae or even gilli). The Australian race was designated only in 1988, with the species itself first noticed in Australia in 1969 and regarded as a recent immigrant. Native Australians, however, differentiated the Sarus and the Brolga and called the Sarus "the crane that dips its head in blood". The Australian race has a distinctively darker plumage and a larger grey patch of ear coverts. This race is the most recently diverged with an estimated 3000 generations of breeding within Australia. 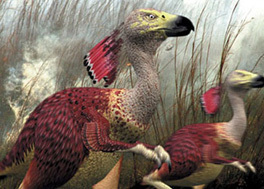 An additional subspecies luzonica has been suggested for the population once found, but now extinct, in the Philippines. It may be synonymous with either gilliae or sharpii. Analysis of mitochondrial DNA, from a limited number of specimens, suggested that there was gene flow within the continental Asian populations until the 20th century reductions in range, and that Australia was colonized only in the Late Pleistocene, some 35000 years ago. This has been corroborated by nDNA microsatellite analyses with four times the sample size. This study further suggests that the Australian population is quite inbred. As there exists the possibility of (limited) hybridization with the genetically distinct Brolga, the Australian Sarus Crane can be expected to be an incipient species. The common name of sarus is from the Hindi name ("sāras") for the species. The Hindi word is derived from the Sanskrit word sarasa for the "lake bird", (sometimes corrupted to sārhans). While Indians held the species in veneration, British soldiers in colonial India hunted the bird, calling it the serious or even cyrus. The specific name of antigone—after the daughter of Oedipus, who hanged herself—may relate to the bare skin of the head and neck. Unlike many other cranes that make long migrations, the Sarus Crane is largely non-migratory; it may however make short-distance movements in response to rain or dry weather conditions. The only migratory population is in South-east Asia. Breeding pairs maintain territories that are defended from other cranes using a large repertoire of calls and displays. Non-breeding birds occur as flocks of various sizes that vary from 1–430 birds. In semi-arid areas, breeding pairs and successfully fledged juveniles depart from territories in the dry season and join non-breeding flocks. In areas with perennial water supply, like in the western plains of Uttar Pradesh, breeding pairs maintain perennial territories. The largest known flocks are from the 29 km2 Keoladeo National Park – as many as 430 birds, and from wetlands in Etawah and Mainpuri districts in Uttar Pradesh, ranging from 245–412 birds. Flocks of over 100 birds are also regularly reported from Gujarat and Australia. During the breeding season, breeding pairs displace non-breeding birds from some wetland sites, and local populations can appear to decline. Sarus Crane populations in Keoladeo National Park have been noted to reduce from over 400 birds in summer to just 20 birds during the Monsoon. They roost in shallow water, where they may be safe from some ground predators. Adult birds do not moult their feathers annually and replace them only once every two or three years. Sarus Cranes forage in shallow water (usually with less than 30 cm (1 ft) depth of water) or in fields, frequently probing in mud with their long bills. They are omnivorous, eating insects (especially grasshoppers), aquatic plants, fish (perhaps only in captivity), frogs, crustaceans and seeds. Occasionally tackling larger vertebrate prey such as water snakes (Xenochrophis piscator), Sarus Cranes may in rare cases feed on the eggs of birds and turtles. Plant matter eaten includes tubers, corms of aquatic plants, grass shoots as well as seeds and grains from cultivated crops such as groundnuts and cereal crops such as rice. Sarus Cranes have loud trumpeting calls. These calls are, as in other cranes, produced by the elongated trachea that form coils within the sternal region. Pairs may indulge in spectacular displays of calling in unison and posturing. These include "dancing" movements that are performed both during and outside the breeding season and involve a short series of jumping and bowing movements made as one of the pair circles around the other. Dancing may also be a displacement activity when the nest or young are threatened. The cranes breed mainly during the Monsoons in India (from July to October although there may be a second brood, and there are records of breeding in all the months and with the onset of the wet season in Australia. They build large nests, platforms made of reeds and vegetation in wet marshes or paddy fields. The nest is constructed within shallow water by piling up rushes, straw, grasses with their roots and mud so that the platform rises above the level of the water to form a little island. The nest is unconcealed and conspicuous, being visible from afar. The nests can be more than two meters (6.6 ft) in diameter and nearly a meter(3.28 ft) high. Pairs shows high fidelity to the nest site, often refurbishing and reusing nests for as many as five breeding season. The clutch is one or two eggs (rarely three or four) which are incubated by both sexes for about 31 days (range 27–35 days). Eggs are chalky white and weigh about 240 grams. When disturbed from the nest, parents may sometimes attempt to conceal the eggs by attempting to cover them with material from the edge of the nest. The eggshells are removed by the parents after the chicks hatch either by carrying away the fragments or by swallowing them. The chicks are fed by the parents for the first few days but are able to feed independent after that and follow their parents for food. When alarmed, the parents cranes use a low korr-rr call that signals chicks to freeze and lie still. Young birds stay with their parents for more than three months. The Sarus is widely believed to pair for life, however cases of "divorce" and mate replacement have been recorded. Eggs are often destroyed at the nest by Jungle (Corvus macrorhynchos) and House Crows (C. splendens). In Australia, predators of young birds include the dingo (Canis dingo) and fox (Vulpes vulpes) while Brahminy Kites (Haliastur ind-us) have been known to take eggs. Removal of eggs by farmers (to reduce crop damage) or children (in play), or by migrant laborers for food are prominent causes of egg mortality. Between 31 and 42% of nests with eggs can fail to hatch eggs for this reason. Chicks are also prone to predation (estimated at about 8%) but more than 30% die of unknown reasons. Breeding success has been estimated at about 20%. In areas where farmers are tolerant, nests in flooded rice fields and those in wetlands have similar rates of survival. Pairs that nest later in the season have a lower chance of raising chicks successfully, but this improves when territories have more wetlands. Little is known about the diseases and parasites of the Sarus Crane, and their effects on wild bird populations. A study conducted at the Rome zoo noted that these birds were resistant to anthrax. Endoparasites that have been described include a trematode, Opisthorhis dendriticus from the liver of a captive crane at the London zoo and a Cyclocoelid (Allopyge antigones) from an Australian bird. Like most birds, they have bird lice and the species recorded include Heleonomus laveryi and Esthiopterum indicum. In captivity, Sarus Cranes have been known to live for as long as 42 years. Premature adult mortality is often the result of human actions. Accidental poisoning by monocrotophos, chloroplasts and dieldrin-treated seeds used in agricultural areas has been noted. Adults have been known to fly into power lines and die of electrocution, this is responsible for killing about 1% of the local population each year. There were about an estimated 15–20,000 mature Sarus Cranes left in the wild in 2009. The Indian population is less than 10,000, but of the three subspecies, is the healthiest in terms of numbers. They are considered sacred and the birds are traditionally left unharmed, and in many areas they are unafraid of humans. They used to be found on occasion in Pakistan, but have not been seen there since the late 1980s. The population in India has however declined. Estimates of the global population suggest that the population in 2000 was at best about 10% and at the worst just 2.5% of the numbers that existed in 1850. Many farmers in India believe that these cranes damage standing crops, particularly rice, although studies show that direct feeding on rice grains resulted in losses amounting to less than one percent and trampling could account for grain loss of about 0.4–15 kilograms (0.88–33 lb). The attitude of farmers tends to be positive in spite of these damages, and this has helped in conserving the species within agricultural areas. Compensating farmers for crop losses has been suggested as a measure that may help. The role of rice paddies may be particularly important for the birds' conservation, since natural wetlands are increasingly threatened by human activity The Australian population is greater than 5,000 birds and may be increasing, however, the Southeast Asian subspecies has been decimated by war and habitat change (such as intensive agriculture and draining of wetlands) and by the mid-20th century had disappeared from large parts of its range which once stretched up to southern China; some 1500–2000 birds are left in several fragmented subpopulations. The little-known Philippine population became extinct in the late 1960s. The Sarus Crane is classified as Vulnerable on the IUCN Red List. Threats include habitat destruction and/or degradation, hunting and collecting, as well as environmental pollution and possibly diseases or competing species. The effects of inbreeding in the Australian population may need to be studied. The species has been extirpated in Malaysia, Philippines and Thailand. Reintroduction programs planned in Thailand have made use of birds from Cambodia. The species is venerated in India and legend has it that the poet Valmiki cursed a hunter for killing a Sarus Crane and was then inspired to write the epic Ramayana. The species was a close contender to the Indian Peafowl as the national bird of India. Among the Gondi people, the tribes classified as "five-god worshippers" consider the Sarus Crane as sacred. The meat of the Sarus was considered taboo in ancient Hindu scriptures. It is widely believed that the Sarus pairs for life and that death of one partner leads to the other pining to death. They are a symbol of marital virtue and in parts of Gujarat, it is a custom to take a newly wed couple to see a pair of Sarus Cranes. Being ubiquitous in the flood plains of the Ganges, observations on their biology had been made by the Mughal emperor, Jahangir around AD 1607. He noted, for instance, that the species always laid two eggs with an interval of 48 hours between them and that the incubation period was 34 days. Although venerated and protected by Indians, these birds were hunted during the colonial period. It was noted that killing a bird would lead to its surviving partner trumpeting for many days and it was traditionally believed that the other would starve to death. Even sport hunting guides discouraged shooting these birds. According to 19th century British zoologist Thomas C. Jerdon, young birds were said to be good eating, while older ones were "worthless for the table". Eggs of the Sarus Crane are however used in folk remedies in some parts of India. Young birds were often captured and kept in menageries both in India and in Europe in former times. They were also successfully bred in captivity early in the 17th century by Emperor Jehangir and in Europe and the United States in the early 1930s. ... The young birds are easily reared by hand, and become very tame and attached to the person who feeds them, following him like a dog. They are very amusing birds, going through the most grotesque dances and antics, and are well worth keeping in captivity. One which I kept, when bread and milk was given to him, would take the bread out of the milk, and wash it in his pan of water before eating it. This bird, which was taken out of the King's palace at Lucknow, was very fierce towards strangers and dogs, especially if they were afraid of him. He was very noisy—the only bad habit he possessed. An Indian 14-seater propeller aircraft, the Saras, is named after this crane.